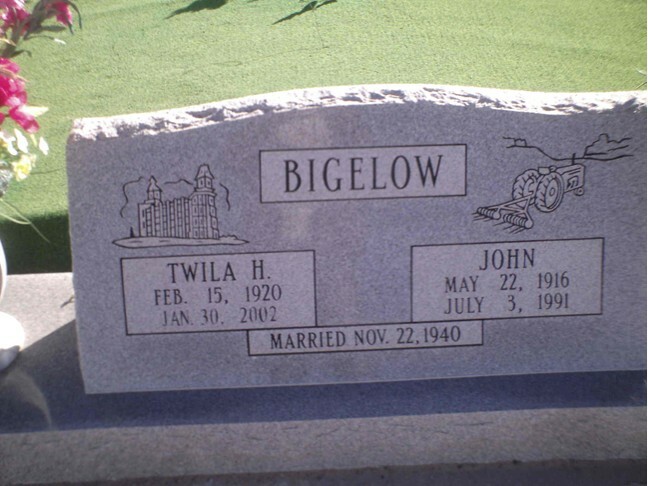 16167.34B Asa Elijah jr. 8 BIGELOW, son of Asa Elijah 7 ( Nahum 6 , Simeon 5 , John 4 , Joshua 3, Joshua 2, John 1), and Elvira (MEACHAM) BIGELOW, was born 08 August 1879 at Gunlock, Washington co., UT. He was known as Lige all his life. About age 20, Lige went to Alaska with half brother, John to join the "Gold Rush" and they remained there about 2 years. He returned to UT and married on 22 November 1905 Mary Jane Gentry at Spring Glen, UT. Lige and May, as Mary Jane was called, homesteaded near Mt. Emmons in Uintah Basin for 12 years then into the St. George area for farming. They were burned out, flooded out, and suffered many losses. They moved into Green River, Emery co, UT where he died 11 April 1947. Widow Mary died 19 July 1962 at Price, Carbon co, UT. Both buried at Price. 16167.34B4t Leona May, b 01 Feb 1914 Spring Glen; d _____ ; m 22 June 1932 Joseph Alma Scovill; 6 children. 16167.34B6 Clifford "E", b 06 Aug 1918 Mt. Emmons; d _____ ; m 13 Apr 1940 Melvina Lance; 6 children. The 1977 reunion was hosted by descendants of Asa Elijah Bigelow in Bountiful, UT, hosted by Mr. and Mrs. David Bigelow (Jean Legereit) Bigelow Society genealogist/historian.